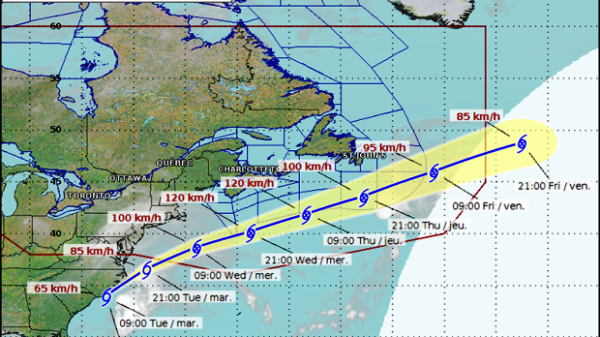 HALIFAX – The Canadian Hurricane Centre says a large storm system that’s tracking towards Atlantic Canada is expected to remain well offshore, but up to three-metre swells are expected in some areas of Nova Scotia and Newfoundland. Forecasters say it is now less likely that potential tropical cyclone ten will become the season’s next named storm — Irma — as it has not organized itself and is struggling to become a tropical storm. But it is nevertheless expected to develop into an intense post-tropical or extra-tropical system as it tracks northeastward across southern Canadian waters on Wednesday and Thursday. Most of the rain and strongest winds are expected to remain offshore, but some rain and gusty northeast winds could brush Nova Scotia and southeastern Newfoundland on Thursday. Up to three metre swells are also expected on those provinces’ southern coasts on Thursday.